A woman's childbearing years are characterized by the occurrence of menstruation, better known as periods. Usually, periods will occur around every 28 days and last for between two and five days, with roughly 35 milliliters of blood discharged each time. The menstrual cycle is intrinsically linked with a woman's well-being, however; often, the first outward indicator of a health disorder or condition is menstrual irregularities. 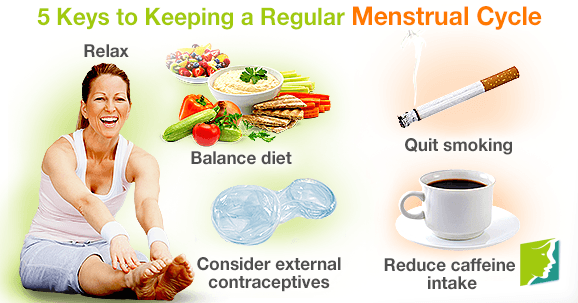 To keep a regular menstrual cycle, it's important to maintain a healthy lifestyle free of hormonal disruptions. Keep reading to find tips on how to do this. Extreme weight loss and malnutrition cause the body to use energy on essential organ and immune system functioning. This means that processes which are less vital for survival, like menstruation, may suffer as a result of this. The recommended daily calories intake is 2,000 for women; fill this quota with fresh fruit and vegetables, fibers, and proteins to nourish your body and maintain a healthy weight. Certain medications interfere with hormone levels and can have a de-regulating effect on the menstrual cycle. Read up about the side effects of any long-term medication and speak to your doctor about finding an alternative if you are bothered by irregular periods. Internal forms of contraception often work by influencing hormonal activity; irregular periods are a common complaint of those using the birth control pill, implant, patch, or injection. You may prefer to consider using external contraceptives, like condoms or diaphragms, instead. Menstrual irregularities are more common in smokers, because the chemicals in cigarettes can drastically lower estrogen levels. Cutting down on smoking could help regulate your periods as well as providing a host of other health benefits, like cleaner teeth and stronger bones. Caffeine is a stimulant that can shorten the duration of a woman's periods and the length of the menstrual cycle itself. Heavy intake can also cause salt and fluid retention, making menstrual bloating and painful cramping more likely. Cutting down on caffeine by replacing your favorite sources - like soda or coffee - with decaf versions could help to regulate menstruation. Stress is a common cause of irregular periods; even on a temporary or short-term basis, stress can affect hormonal balance and cause missed or sporadic periods. Spending an hour every day enjoying “me-time” - whether this means reading a book, watching a film, or going for a long walk - to maintain a calm and contented state of well-being could go a long way in reducing stress and its effects. While a regular menstrual cycle is desirable, most women will experience irregular periods at some point during her menstrual life. Though these may be annoying and frustrating, they are usually explainable and not cause for concern. When menstruation is irregular in spite of consistently following the listed suggestions or worrying symptoms arise alongside menstrual irregularities, it may be worth consulting a medical practitioner to rule out any health concerns. Continue reading about the best ways to manage irregular periods. Are Migraines a Side Effect of Irregular Periods? Many women experience irregular periods. Click learn what can cause them, and how to regulate your cycle and the hormone levels in your body. If you're finding irregular periods difficult to handle, read on to uncover simple and effective techniques for managing menstrual irregularities. Changes in flow and more severe pain are symptoms of irregular periods. Learn how to make a soothing infusion to ease them here.